Charter rates are in Euro (€) and refer to weekly charter period. Charter rates include hire of sailing yacht and her equipment (as stated at the relevant section of yacht’s description), mooring expenses as well as water and power expenses in registry port. Charter rates include VAT. Currently VAT rate applicable on total charter fee is 24% for charters up to 48 hours and 12% for charters of more than 48 hours duration. The VAT rates mentioned herein are the ones applicable by current tax legislation valid to this date (Sept. 2nd, 2018) and subject to change without prior notice on the Broker or the Owner. Crew Gratuities (tips) is not included in charter rates and are at Charterer’s discretion. A gratuity between 5% and 15% of the contracted Gross charter fee is what is applicable by market’s standards but the Client is under no obligation to leave a gratuity unless he wishes to. 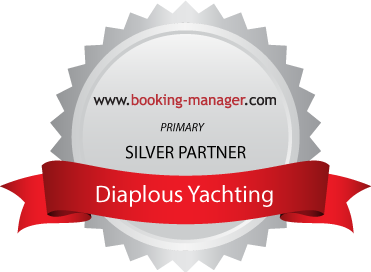 Diaplous Yachting sailing yachts are offered on a Saturday to Saturday basis unless agreed otherwise. Embarkation time is Saturday at 17:00 hours. Diaplous Yachting sailing yachts are delivered with full fuel and water tank and are expected to be returned at the same condition. Disembarkation time is on Saturday no later than 09:00. In order to ensure that sailing yachts will be redelivered on time on Saturday morning, they should be returned at the marina at the previous day, on Friday, no later than 18:00 hours. In addition to this, the Client has the obligation to take into account weather conditions in order to ensure redelivery of the yacht on time. He should also bring the boat at an adequate distance from the charter base the last 24 hours of the charter period. Any delayed redelivery due to weather conditions shall not be acknowledged. Any delay longer that 1 hour will be charged with double rate of the daily charter rate plus any costs arising from the inability to deliver the yacht on time to the following Client. Obligatory (end cleaning) or optional extras are payable upon embarkation by cash only.v If the Client wishes to have a professional skipper or hostess onboard, this should be specified upon booking confirmation. If the Client wishes to have any of the optional extras, this should be specified no later than one week prior to embarkation date. Cancel 89-60 days before departure: 30% of the fees is retained. Cancel 59-30 days before departure: 50% of the fees is retained. The date of the receipt of the cancellation notice should be the basis for the settlement of the above mentioned cancellation fees. If the yacht is rebooked for the same period and under the same terms, cancellation fees will be refunded. Before the delivery of the yacht the Client should pay the security deposit by credit card (Visa or MasterCard) in Euro currency. Provided that the yacht is redelivered without any problems the security deposit has to be reimbursed in full. Otherwise the equivalent value of the repair will be kept from the security deposit. Diaplous Yachting yachts are insured according to the Greek Law against risks arising from liability to third parties and damage to the hull, machinery and equipment. In the event of a bareboat charter, the client must provide original sailing certificate / license (in English language or translated). Copy of this should be submitted to Diaplous Yachting at the time of the booking. Apart from this, the Client should be competent and capable to sail the yacht. If proven otherwise, Diaplous Yachting reserves the right to provide Client with a skipper according to the optional extras Price List.